This Valentine's Day, escape to Tasmania in style and experience the romance of sea travel. There's something magical about sailing into the sunset and waking up in a new destination the next morning, refreshed and ready to start your touring adventure in the comfort of your own vehicle. Treat to yourself and your loved one to a romantic escape with Spirit of Tasmania. Enjoy a sea change with spectacular ocean views, freedom to stretch your legs and unwind with some of Tasmania's finest food and wine. Your return journey will be available for just $419* when purchased in conjunction with this package. 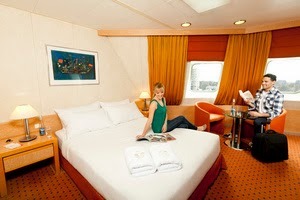 Price includes the return sailing for two adults, accommodation in a Twin Porthole Cabin and carriage for one standard vehicle. *Terms & Conditions apply. To enquire or book phone 1800 996 603 between 8:00am and 6:00pm Monday to Friday (offer not available online). Offer available until 11:59pm 31 January 2014 unless sold out prior. Only four Valentine's Day packages available each way. For full terms and conditions, please call 1800 996 603.